This incredible performance is achieved by pairing the 3.5-liter, direct-injected SOHC i-VTEC™ V6 engine featuring Variable Cylinder Management™ (VCM™) with one of two incredible transmissions: the 9-speed automatic transmission, or the Honda-developed 10-speed automatic. The 10-speed transmission delivers incredible responsiveness and refinement, and brings unheard of capability to this front-wheel-drive vehicle. Honda set a high bar with the 2018 Honda Odyssey, and sent a challenge to the auto industry. Of course, the 2018 Honda Odyssey couldn’t reign supreme forever; someone was bound to top it. Luckily for us, and for the drivers who come into our dealership near Los Angeles, CA, it was the Honda brand. Right now, the 2019 Honda Odyssey sits in the #1 spot in U.S. News & World Report’s rankings of 2019 minivans. It beats out rivals in cargo space, fuel economy estimates, ride, and performance. A spacious, well-built interior complete with intuitive infotainment system makes it feel like you’ve been driving this car for years, even if it’s your first time behind the wheel. 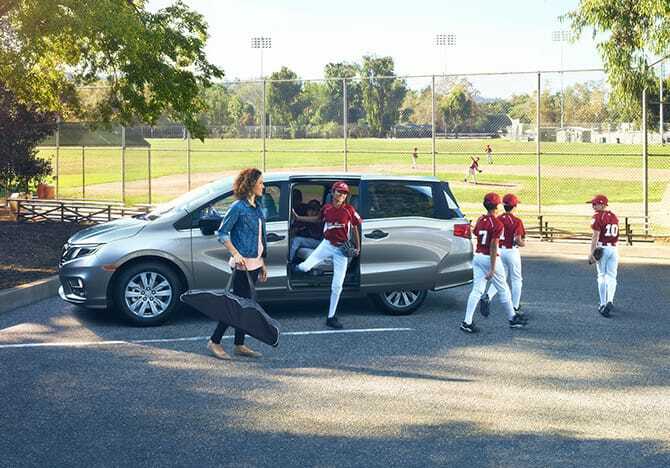 Your family is sure to feel at home in the 2019 Honda Odyssey as well thanks to great features like the available Advanced Rear Entertainment System. If we’ve piqued your interest, be sure to stop into Keyes Honda today for a test drive—and don’t forget to bring your whole crew!